Benji Menendez is one of those living legends of the cigar business, a cigar maker who is still blending tobaccos and passing on the tradition years after most mere mortals would be enjoying their retirement. Menendez has an entire lifetime of experience to draw on. 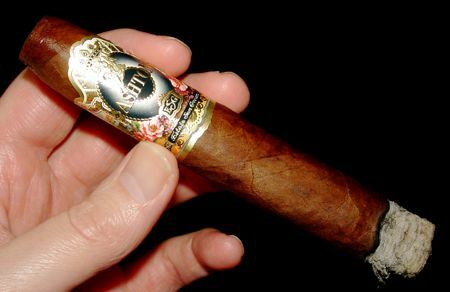 In fact, when you see the M & G insignia on a Montecristo cigar band, that M stands for Menendez. As an heir to Cuba’s largest cigar factory, H. Upmann, and the Menendez y Garcia tobacco concern, young Benjamin had a lot to look forward to as he grew up in an upper-class Havana neighborhood. Despite his privileged position as the son of the company’s majority owner, he still had to learn the industry from the bottom up, starting with packing cigars, and then working his way through the departments to a management position. In 1960 the factory was seized and from there the Menendez story takes an all too familiar turn. A new start in America was about to begin, starting in Miami and soon moving to the Canary Islands, where Mendendez created the blockbuster Montecruz brand. Many years later he became the head of premium cigar operations for General Cigar. Fifteen years after that, during the cigar boom of the late 90’s, Menendez joined the Spanish giant Tabacalera, which eventually merged with SEITA to form Altadis. Now he is back again with General, where the powers that be have in all their wisdom tasked him with the creation of this limited edition Partagas. Only 5000 boxes of the Partagas Master Series were made, and in only one size, a 6 x 46 Grand Corona dubbed Majestuoso. Like the Montecruz of the 60’s, this one has an attractive Cameroon wrapper. 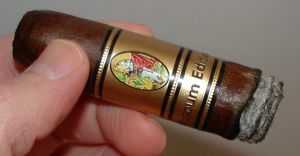 The rest of the blend is more unusual: a Habano binder grown in Connecticut, filler from the Dominican Republic (piloto cubano) and two different regions in Nicaragua (Esteli ligero and Ometepe.) On paper this sounds like a thunderous cigar. In practice it’s actually quite smooth, but very expressive at the same time. The roll is rock solid, but it draws with even and easy tension. The wrapper is dark with fine veins and appears slightly toothy. The head is rounded with a cap that is so well integrated the seams are difficult to detect. It burns evenly and builds a solid, firm, and neat long ash. Overall excellent — near perfect — construction. 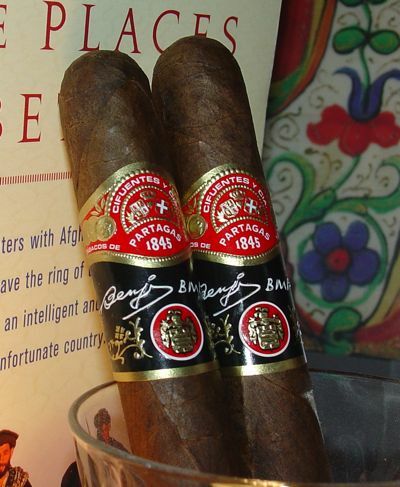 The Partagas Master Series Majestuoso is a medium to full bodied cigar with lots of flavor. Taken slowly it’s smooth and easy to smoke, but it can develop a bite if rushed. From the first pull it’s evident that this blend is heavier than the standard (Non-Cuban) Partagas line. The flavor is a complex of cedar, spice, leather and coffee in varying combination as the stick burns through the first third. There is a touch of black pepper which will return again in the last section. An acidic edge cuts through the chocolate and cinnamon in the middle third, leaving a tea-like tang on the tongue. The body of the cigar is light enough not to overpower this subtle touch, but heavy enough to coat the palate with an array of flavors. The aroma is rich with cedar and coffee, while leather spiked with pepper lingers on the finish. The strength of the cigar comes through at the finale, hitting me in the gut but not knocking me over. The aroma becomes piney and the aftertaste grows a little bit salty. Some char appears near the band. Benji Menendez’s Master Series blend is an accomplishment worthy of a man who has dedicated his entire life to the art of the cigar. It’s flavorful, complex, smooth, and balanced. It’s expressive without being aggressive. It’s just a really fine cigar on all fronts. It’s also priced within reason, especially for a limited edition release of such high quality. Ten American greenbacks is about all this one will set you back. But get them while they’re still around, because they won’t be for long. Altadis has commissioned 3D artist Charles Fazzino to create prints for their “Museum Edition” cigars, of which there are now two: the 6 x 53 Montecristo, and this one, the 6 x 54 Romeo y Julieta. They are special edition cigars, of course, and as such are touted as “super premiums,” which means that the retail price is exorbitant. In this case, around 30 USD per stick. Yikes. 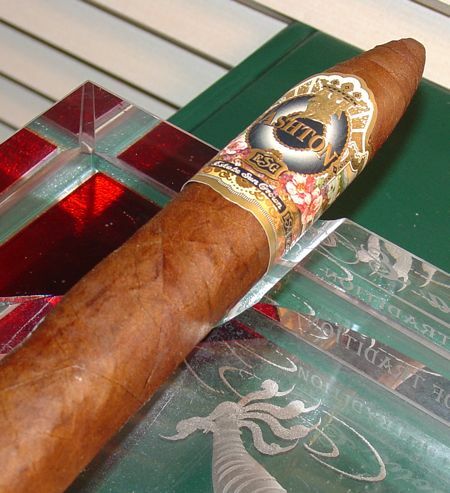 The big draw with this release is the limited edition humidor which houses these big ticket sticks. The humidor includes a signed and numbered giclee print. I’m no art collector, but maybe this will be worth something some day. I hope so anyway, because the price for the whole shebang is $1080.00. Instead of the pile of gold doubloons that I would expect to find in a box with that price tag there are 36 cigars encased in frosted crystal tubes. 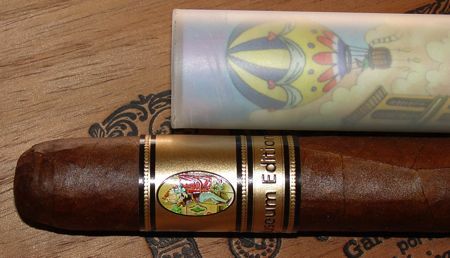 A paper thin cedar sheath inside each tube cradles the cigar, along with a Fazzino picture that just barely shows through the frosting on the glass. Me, I’d take the cedar sans the picture, but like I said, I’m no art critic. The gold cap that tops each tube is wedged on pretty tight — I actually crushed the tube in my massive Hellboy-like fist while I was trying to open it in the cigar shop. Be careful with this one, especially if your mechanical skills are as primitive as mine. This cigar is made in the famous Tabacalera Garcia factory in the Dominican Republic. The wrapper is a San Andres Criollo 98 Rosado (yes, that’s Mexican, but we’re far from Te Amo territory here) with a Connecticut broadleaf binder and a filler blend from Nicaragua and the Dominican. Only one size is made: a 6 x 54 parejo. Despite its girth the cigar sits nicely in the hand, and seems to be well rolled. The head is finished nicely with a triple cap but the final piece is jagged and appears a little sloppy. (At $30 per cigar I reserve the right to be picky.) 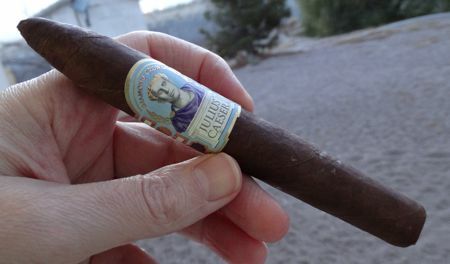 The wrapper is a real beauty though — a rich, dark colorado maduro leaf that glistens with oil. Even though the pack seems solid enough, the draw is a bit loose. This caused some problems down the road — I sat the cigar down for just a minute to freshen my drink and it went out. On the positive side, it produced plenty of smoke and never burned hot the way some loosely packed cigars will do. From the start I had trouble keeping this one burning evenly, but this seems to be the curse of really tasty wrapper leaf. 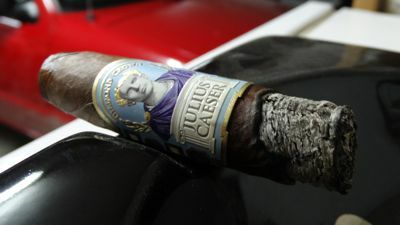 It also burns fairly rapidly for a cigar with such a large ring gauge — smoking time was a little under an hour; I expected a bit more from a cigar this size. Overall construction good, but not 30 dollars good. Almost immediately the Romeo Museum Edition displays tremendous complexity. It’s extremely smooth, mild to medium in body, and has a delicious and distinct aroma. This is obviously the selling point. The wrapper on this cigar is a wonder. The first notes are the ones that stay for the duration of the smoke: sweet caramel over an herbal base that has an unusually malty edge to it. After an inch or so the herbal flavor morphs into an sweet earthy taste that at times reminded me of something more musky, something almost like gunpowder. It’s complex but very easy on the palate. Eventually coffee flavors come to the front, though it’s not standard coffee — it’s one of those poncy latte things with cream and caramel and God knows what else. It’s good though. The sweet malty aroma continues, with an occasional whiff of bread. The last section is a little more straight forward: earthy and sweet, with the caramel notes getting fruitier toward the end. I was a little frustrated with the burn at this point and might have been puffing a little too hard, forcing the cigar to burn too hot. Some acrid notes muscled their way in after I removed the band, but with a little more patience I might have avoided this. Despite its flaws, the Romeo y Julieta Museum Edition is a terrific cigar. The flavors here are tremendously varied and interesting, spanning the spectrum from sulfurous earth to caramel-sweet bread. The amazing thing is that these disparate flavors never conflict; instead they combine and follow one another in remarkable harmony. The blender here is to be congratulated — this is a really fascinating bunch of leaves. But with the caveat that I have smoked all of ONE of these cigars, the roll could have been tighter and the burn was less than spectacular. Perhaps this is the price you pay for the smorgasbord of subtleties on display here, but I won’t deny that there were a few relatively minor construction issues. Keep in mind that this is a fairly mild cigar. I know many veterans of the leaf who would be simply bored with the Museum Edition, but I am not one of them. What this is, I think, is the absolutely perfect beginner’s smoke. It’s quite mild, superbly smooth, and marvelously complex. If your taste runs to powerful pepper bombs that leave your mouth scorched with spice, this cigar is not for you. 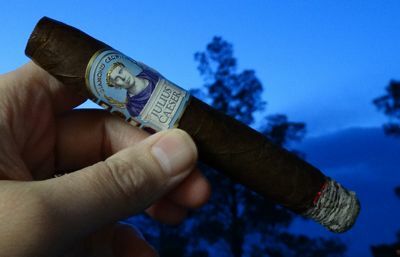 But if you appreciate the subtleties of milder cigars, definitely give it a shot, as long as the price is right for you. For me, thirty dollars is ridiculous. But if I could snap some of these up for ten, I just might.